In their unabashed criticism, which can be found in a new volume of essays to be published next week, the Archbishops of York and Canterbury warn the public that political leaders are peddling the dangerous “lie” that economic growth will solve Britain’s social problems. The archbishops, who have edited the essays, strongly and unequivocally condemn the “rampant consumerism and individualism” which has “dominated” the UK since the 1980s reign of Conservative PM Margaret Thatcher. 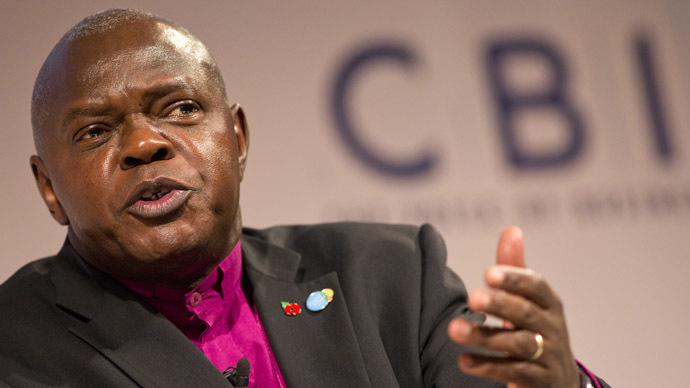 The book includes contributions from John Sentamu, the Archbishop of York, Justin Welby, the Archbishop of Canterbury and former Labour Cabinet Minister Lord Adonis, amongst others. In particular, the senior religious figures questioned the validity of the Conservatives’ slogan, “We’re all in this together,” claiming Britain’s poorest are plagued by “evil” inequality. The attack comes at a particularly sensitive time for the Conservative-led coalition government, just ahead of the May 2015 general election. Historically, the Church of England has been known as “the Tory party at prayer,” but in recent years some leading church figures have taken a more radical position on government-imposed austerity than the mainstream political parties. The collection of essays, called “On Rock or Sand,” has been released as a deliberate political “intervention” during the beginning of the parties’ election campaigns. It contains a gloomy report on Britain’s economic recovery from Archbishop of Canterbury Welby, who claims “entire towns and regions” have not benefited from the country’s economic growth. Welby further says economic regrowth is particularly difficult for the neglected areas. “Our economy appears to be, in one sense, a tale of two cities – one being a growing and constantly improving London (and the South East generally), and the other being most, but not all, other cities, alike in that they are each trapped in apparently inevitable decline,” he writes. Sentamu further invites readers to examine the 1985 text “Faith in the City,” which was criticized by the Thatcher’s government at the time as “Marxist” political literature. Since that attack, the Church has “lost its nerve” and no longer so openly condemns government policy, Sentamu said. The publication is aimed to knock the wind out of the Conservatives initial election campaigning, and is not expected to be well received in government circles.